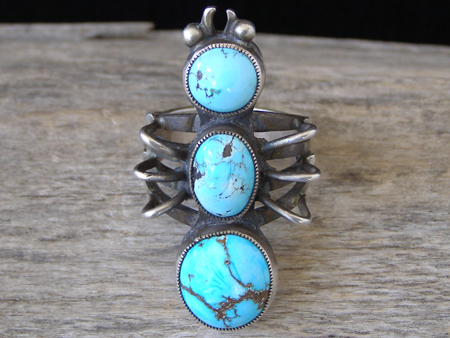 This three-stone ring is set with high-domed stones of natural, untreated Persian turquoise forming an ant design. The stones are set in finely serrated bezels. The shank is split into four narrower bands before attaching to the ring back. Great rock in a nice Traditional Revival design! Stones: head 3/8" diameter; middle 7/16" x 5/16"; abdomen 9/16" x 1/2"
Ring face: 1 3/4" x 1/2"